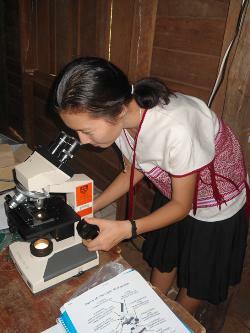 Microscopes donated by the School of Biological Sciences have made their way to a refugee school on the Thai-Burma border. The two second-hand microscopes donated to the Thoo Mweh Khee Senior College will boost the student's science understanding and hopefully, their curiosity too. "As a refugee school on the Thai-Burma border, science is often taught very rudimentally," said Dr Shirley Worland, administrator of the school. "These microscopes have added a new dimension in our teaching." The compound microscopes made their way to Thailand via a number of hands. Faculty of Science member Cindy Wilkinson facilitated the donation with Michael Joseph, Manager of Teaching and Research Support in the School of Biological Sciences. The microscopes were collected by Australian Catholic University's Masters student, Dermot Carberry, who is on a field placement at the Thoo Mweh Khee Migrant School. They are now safely in the hands of the students. "Our students, our volunteer teachers and national staff are very excited by the new opportunities for learning they have provided," Dr Worland said. And while the focus of the school is to deliver a senior level of education in English language we hope the microscopes will serve to educate and inspire the students of Thoo Mweh Khee Senior College about the microscopic world around them.